On Friday, November 8, Congressman Kurt Schrader will update Salem City Club members and guests on the roll out of the Affordable Care Act and on end of the budget year activities in Congress. Join us to hear Congressman Schrader’s perspective on the roll out of the Affordable Care Act and the latest budget developments. Schrader is Co-Chair of the New Democrat Coalition’s Health Care Reform Task Force. In addition, he currently serves on the House Committee on Agriculture, House Committee on Small Business and House Budget Committee. He is the ranking member of the House Committee on Agriculture Subcommittee on Horticulture, Research, Biotechnology and Foreign Agriculture. Schrader is also the Co-chair for Communications for the Blue Dog Coalition. 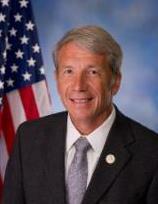 Please join us as welcome Congressman Kurt Schrader on Friday, November 8, 2013. As is our tradition we meet at the Willamette Heritage Center at the Mill in the Spinning Room. For lunch reservations email rsvp@salemcityclub.com before noon Wednesday, November 6, 2013. Parking is free. Doors open at 11:30 AM. For more information on this program please go to www.salemcityclub.com. The SCC Membership Drive is in full swing. With 15 new members this season, we are off to a great start! By now, you should have received at least one email describing the Membership Drive with a link to the Member for a Day Certificate. If everyone passes one Member for a Day Certificate to someone, we will have introduced over 150 potential members to Salem City Club. Many people who join City Club do so after attending at least one of our fabulous programs. We'd like to give more people the opportunity to do just that. Please Pass It On. Help us spread the word by passing a Member for a Day Certificate to your email contacts who might be interested and invite them to join you at an upcoming program. Print copies to hand out to friends and colleagues. Paper copies of the certificate will also be available at all programs through December 13, 2013. Every person who redeems a Certificate will be entered into a drawing for a free lunch at a future meeting. Every SCC member identified as responsible for a new membership will be entered into a December 13 drawing for a Weekend at the Beach. Thank you to everyone "Passing It On". A special thanks to Rose Kachedoorian for being both a New Member and introducing another New Member to Salem City Club within 30 days. If you have questions about Salem City Club Membership or the Membership Drive, please contact Cindy Condon at cindycondon@comast.net. November 22: Norm Gruber, President and CEO of Salem Health: From a cottage industry to corporate entities: How and why hospitals must change to survive The third program in the Health Care for Oregonians series. December 13: My New Year's Wish for Salem.